An indie pop band with spirit, the easy-going sound of Rilo Kiley is airy and light, perfect for a warm summer's eve. A sunny afternoon, driving in your car with the windows down. Or sitting down and putting your head back, relaxing to the vibrant sounds and soothing melodies that intertwine so colorfully. 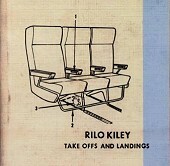 Take Offs and Landings, originally released on Rilo Records, and soon re-released on Barsuk, is a delicious collection of all the positives indie pop has to offer. The songs have feeling, the vocals inviting, the music tight and enjoyable, and the overall song always manages to make you smile, no matter what you're feeling.